I would love to see a tote bag...that looks just like the pillow. Love the triangles!!! So pretty! 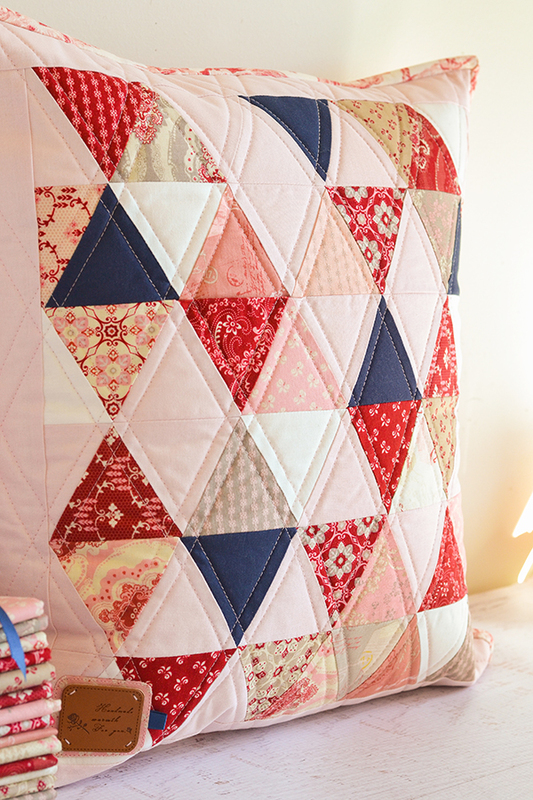 I love your triangle design and would like to try a quilt with that same pattern and colors. 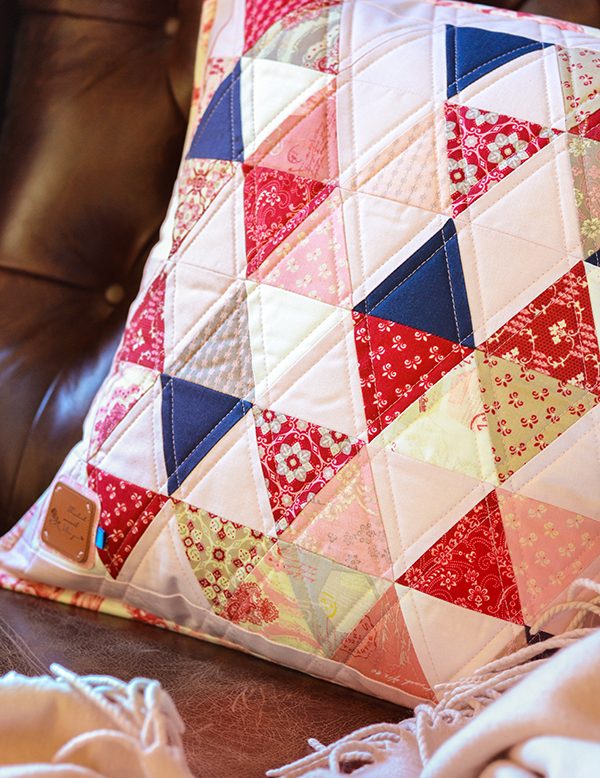 I think I would have to attempt to make this gorgeous pillow! A table runner would be lovely too. A triangle table runner, wouldn't that be nice?! These are gorgeous! Just moved my mom into a new place where she is having to go down to a twin bed. These would make a fabulous quilt for her bed. Thanks for the opportunity to win! Summer clothes for our baby girl? Or a quilt for her cot? What a beautiful cushion! These fabrics are so beautiful! I'd love to do a triangle quilt :) Thank you! I'm thinking about sweet hexie pouch. 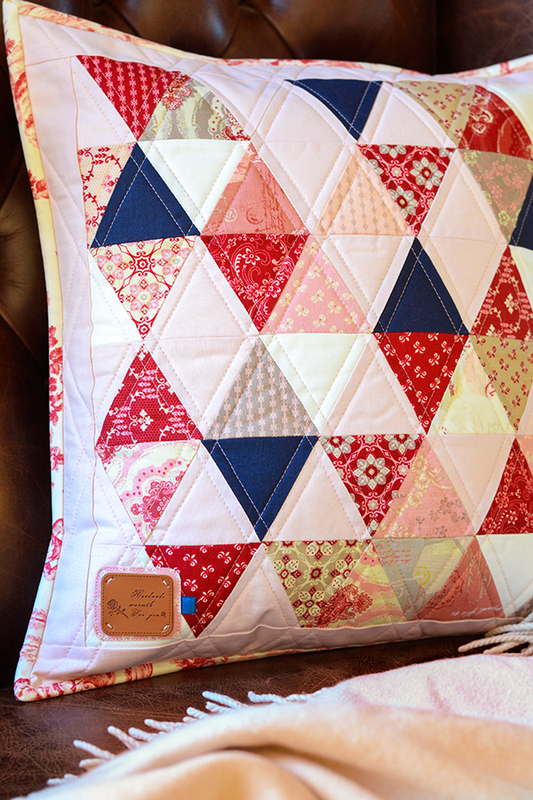 And Ohio Star pillow cover... Triangle cushion is fantastic! I have a friend's little girl's first birthday coming up and this would make a gorgeous quilt for her. I love this fabric and would love to make a table runner for my coffee table! Oh I would love to see this in a star throw. Thanks for the give away. Your cushion is lovely! So well made. I an really into small pouches right now and little girl skirts with ruffles. So I know they would find their way into that. I'm a beginner quilter and am working on Carina Gardners quilt along and a couple of those prints would go so nicely!! Thanks!! Que linda! Um trabalho maravilhoso! 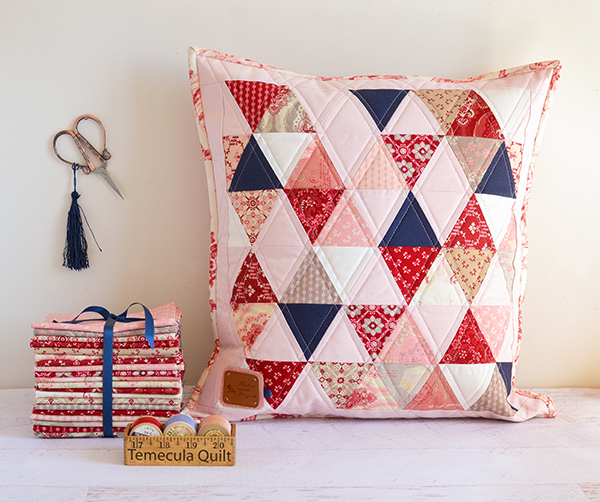 Ainda sou uma novata nos trabalhos de quilt, se for a feliz contemplada, adorava fazer um quilt para o meu filhote: o vermelho e branco são as cores da sua equipa de futebol! Parabéns pelos trabalhos lindos que nos tem mostrado. Love the pillow! I would make a throw quilt. Thanks for the giveaway. What beautiful work! I would make a few Valentine table runners for my sister and someone else. Thank you for this giveaway! I love everything you make! I might make a table runner. Thanks for the opportunity to win. Gorgeous! I would love to make a throw in the same pattern. Oh my goodness that is lovely! I would make a quilt hang in my daughters room. The colors would go perfectly! I would have to make I would have to make a quilt, and with so many on my wish list this fabric would be ideal. I would love to make a tote. The one Amy made for you is inspiring. The fabrics are lovely. Thanks for sharing. Your pillow is inspirational, I'd try that! So pretty. I would plan a mini quilt or a table runner with this beautiful fabric! I could definitely see myself making a lap quilt - just for me. This design and fabric would make it perfect. I love your pillow. Have been wanting to try a pattern called Just A Small Slice, Please. It is a 48x60 quilt, and the pattern calls for a fat eighth bundle. Beautiful colors in this line of fabric. I like this triangle pattern. I think I would make a runner for my bedroom dresser. 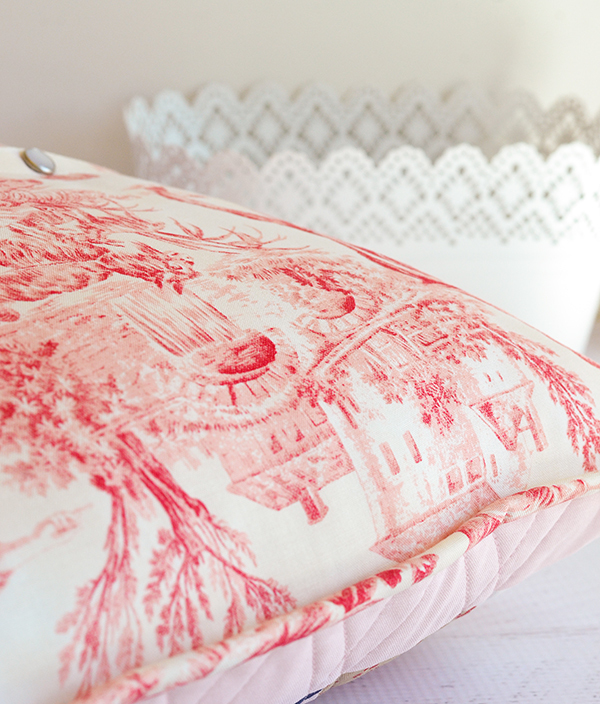 Oh - beautiful pillow with this beautiful fabric. I especially love the fabric on the back!! I would love that fabric to make a beautiful table runner. LOVE THE PILLOW (AND THE TAG). I would make a lap quilt and if there are leftovers, a pillow to match. Thank you for the giveaway !!! What beautiful colors - love to make a new quilt for summer with these beautiful fabrics. Thanks for the giveaway. I would make a Debonaire by Sew Emma quilt. Beautiful fabrics and so feminine. Very nice! I love the fabrics. I would make a lap quilt. 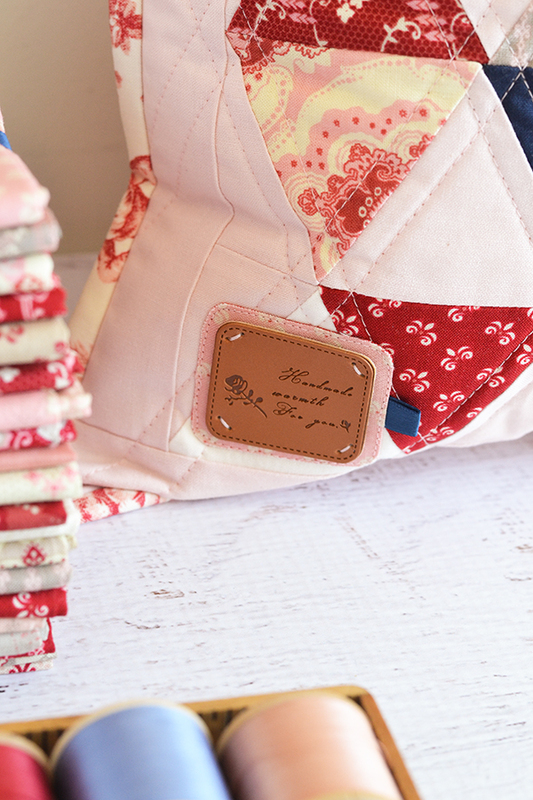 I adore the fabric and it is so sweet that you are offering a giveaway! Then with the left overs, I would make a few things, maybe a little quilt for my grand baby Sarah, and a zipper bag for my other daughter, and a belt for my sister, and a hat for my mom. I just love this fabric so much!! I love what you did with the fabric. I think I would make a large cushion for the wicker chair in my dining room. These fabrics would be perfect. I love the colourway and I think I would love to make a modern table runner for my daughter. She is raising four daughters, four hamsters, two cats and a busy husband but still finds time to invite Nanny and Grandpa for dinner! Love her to pieces. 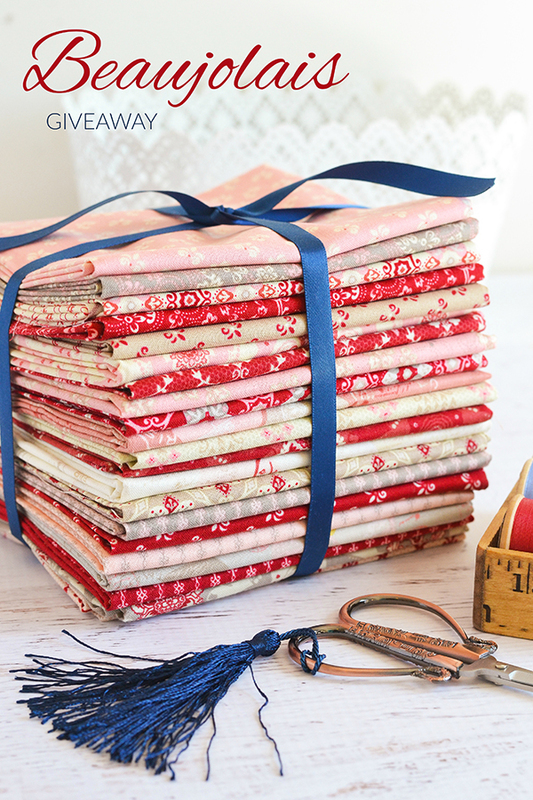 i would go back to basics and make a patchwork quilt with this bundle ....sometimes simple is sweet. How fun! Would love to do a table runner with these scrumptious fat eighths of my favorite colors! I'd make a table runner. So pretty!! The pillow looks great on your husband's chair. 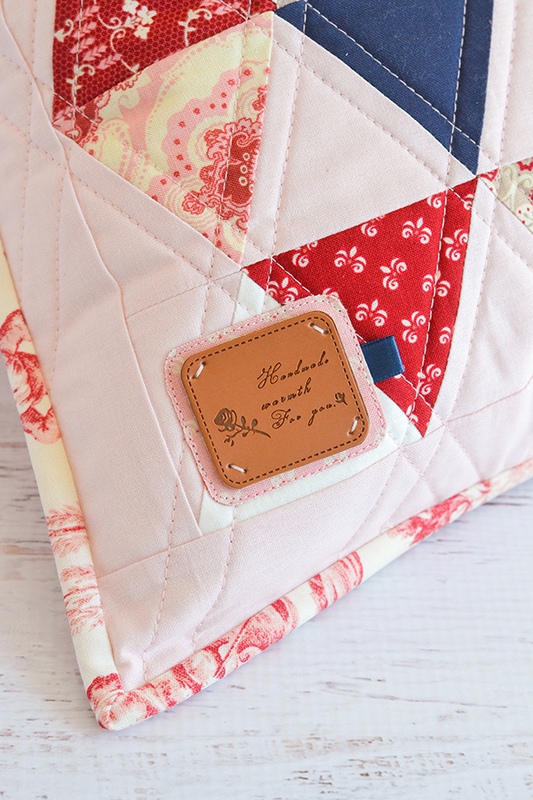 I would probably make a baby quilt if I were to win the fat eighth bundle. I would make a paper pieced wall hanging! Those fabrics are gorgeous!!! I think these fabrics would be perfect accents on a new bag. I would add to my red, pink and gray stash that I'm saving to make a quilt. Perfect! Oops... so very beautiful!! ❤️ I never win these but I'll gladly try my luck!! Hmm.. what would I make with this gorgeous bundle of goodness!! I think first I'd tackle a sweet mini quilt or table runner with it! This is adorable! I have been eyeing this collection for a while now, would be so lovely to win it... I wanted to make a tablet slipcover with it. Thanks for the giveaway! The colors are perfect for a table runner for summer. Love these fabric colours together. I would make a new quilt for my bed. Have been wanting to make a quilt with red for a long time. Thanks for this wonderful giveaway. Love the color palette in the collection. Would love to make my daughter a quilt for the " big girl" bed she will be moving into soon. I love the fabric and your cushion. It would be a beautiful quilt! I've got a "Hello summer!" wall hanging pattern that is calling out for these! 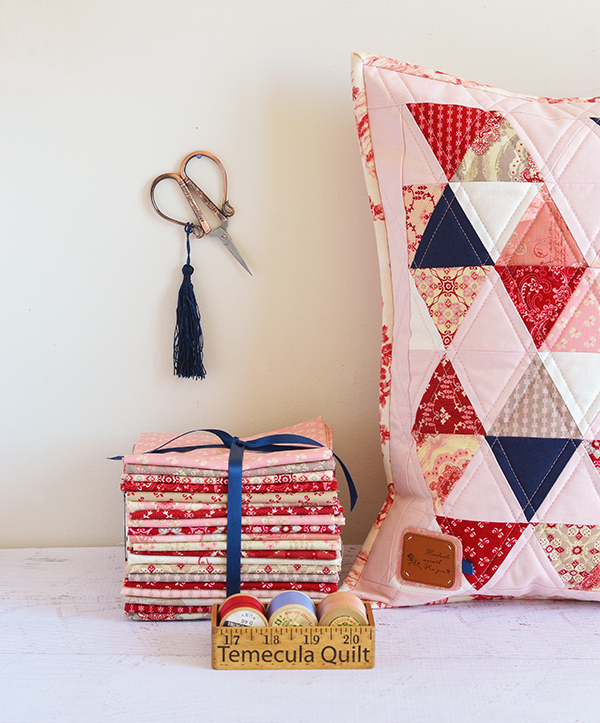 I adore the pillow on the cover of your book Quilt Petite and would love to use the fabric to make it for my cousin for her birthday! I love your triangles! I would make pouches 😍 Thanks for the chance. Your daddy cushion is awesome. The fabrics are great and I would love to make some cushions and a table runner for my house. This is so pretty. And they have toile?! 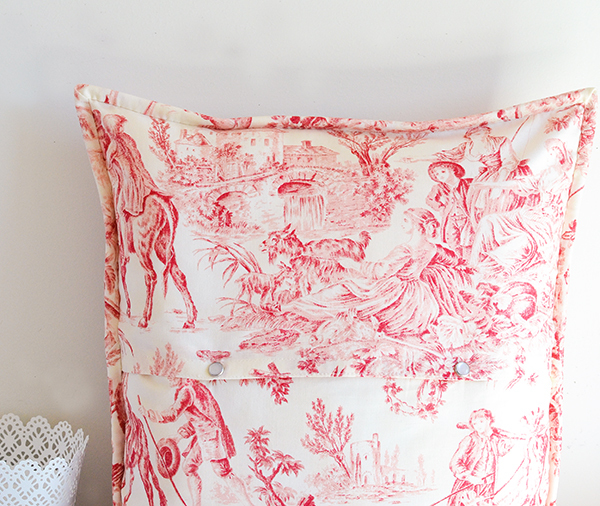 I just love me some toile. (off to check it out.) I'm putting together fabric for a pink(ish) quilt and this would so perfect to add to it. I love your pillow! It would be fun to make! This would be great for my yearly donated breast cancer awareness quilt. I would have to try making one of your pillows, that one is perfect match for the chair my MIL has. I would love to make a pillow BUT a bolster pillow to go in front of my daughters's 2 euro pillows. What a lovely pillow! And I love the label too. I would make some cosmetic pouches with this lovely fabric. I love the pillow. I would like to make a lap quilt for myself. I think I would also make a pillow. Love, love, love the label tag! Such a lovely color palette. I think these would be perfect for a baby quilt. I would definitely make a baby quilt as our 4th granddaughter was born last weekend! I would love to make a wall hanging or mini quilt. The blue is just the pop of color in the midst of all the reds and pinks. Love it. I would love, love, love to make a mini quilt for my soon-to-arrive grandbaby with this collection. It would contrast her gray nursery so beautifully! 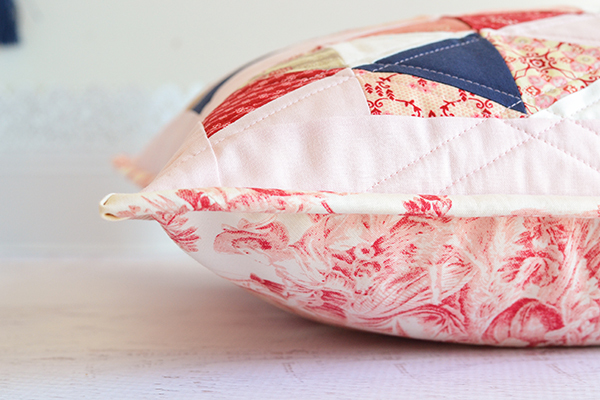 This is a beautiful cushion for a beautiful purpose. Your husband is a lucky man! I love the navy tossed in. It is a perfect combination with those romantic flowers and soft tones. Id love to win this line. I am planning on making a smitten quilt (pattern by Lucy Kingwell) and I think these fabrics would perfectly fit that goal. Thank you so much for a chance to win! What a beautiful cuscion you made! I would make a mini quilt with this fabric line. Thanks for the giveaway! Arzu Yetim: Such a beautiful combination of colors and design! I'd make little quilt for my four year old niece, maybe a cushion for her room or a summer dress. A baby quilt for Rosa! What lovely fabric! I'd use it for a cushion cover too. Thanks for the giveaway. quilt for our living room.. beautiful! A quilt for sure. Beautiful fabric. I would totally make a gift undercover maker mat for my sister! Love this line! Lovely fabric! 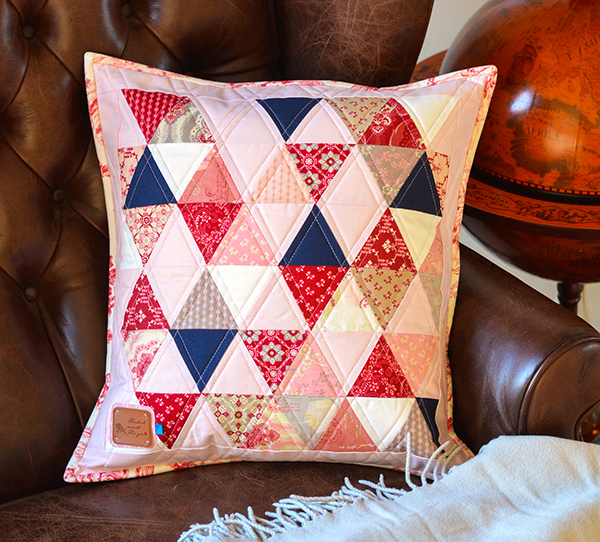 I would make something pretty using English Paper Piecing like a Lucy Boston block or a mini quilt. Love the cushion! It would also make a very striking mini quilt. Thank you for the great giveaway. Have a super great day! I love this fabric and would make a table runner with matching placemats. This would make a wonderful red and white star quilt! I've been wanting to make some pillowcases and wouldn't that fabric be pretty? I love your pillow. A very lovely use of the fabrics and a beautiful sewing job. some beautiful pillows for my bed would be just the thing for me. your pillow is gorgeous. fingers crossed for some fun sewing. one question, where do you purchase your beautiful leather tags. such a lovely finish. I would create a Christmastree with the pattern from Simi´s (Simone Streicher / Germany) That are really good fabrics for such a project. My newest great-niece is due soon, so I need to make a pretty baby quilt. Beautiful cushion! I would like to make a throw quilt for a dear friend who is in a new apartment. Your pillow is so pretty. I would make a mini quilt with these fabrics. What a pretty bundle! I think I would make placemats with it. Your cushion looks terrific! What a great bundle! 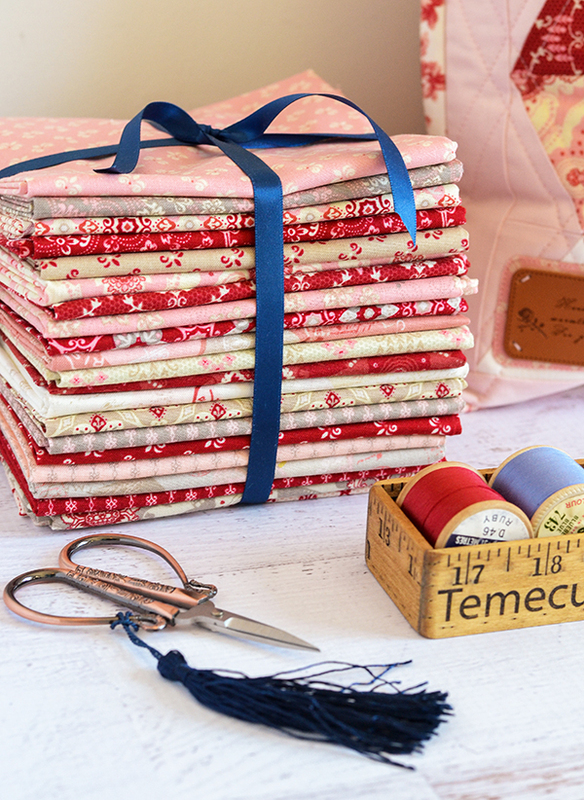 I'm currently making a red-whitish quilt and these fabrics would look great with it! Gorgeous! Your husband must be very nice, mine would call these girlie colors :) but I would make a quilt for my daughter with them! Your husband has very good taste! These colors remind me of spring and I wish we had some here right now instead of the fresh snow and just-above-freezing temps! I would make a table runner out of this bundle to give me a smile each time I walked past my hutch. I have purse pattern that would be perfect. Thank you for the opportunity to win! Gorgeous cushions....lucky hubby! Especially love that label, so unique. Btw where did you find that cute little wooden box? ** GIVEAWAY NOW CLOSED ** Entries after this point will not be valid. I will post the winner shortly.